Standard & Poor's forecasts outstanding corporate debt to grow by two-fifths to $71 trillion by 2019, with China accounting for 40% of the total. What are the biggest corporate risks that may destabilise global financial markets? Our studies show that the risk of global corporate credit quality worsening is moderate. However, we remain concerned about two key tail risks that may drag down credit performance over the next half decade. Our number one risk is the scale and growth of corporate debt in China. Second is the rapid rise of US leveraged finance debt and the potential for a shakeout in this market when US-dollar interest rates rise. Another tail risk, albeit much smaller, is Latin American debt. Why is China’s corporate debt the highest risk? Although the credit cycle is in the slowing phase, China's credit growth rate still remains faster than most. Globally, we expect outstanding corporate debt to grow by two-fifths to $71 trillion by 2019. With 40% of the total, China will have the lion’s share. We also estimate that companies may seek up to $57 trillion in refinancing and new debt over 2015-2019, with China consuming $23 trillion or 40% of that global demand. Rapid debt growth, opacity of risk and pricing (partly due to bank loans dominating funding), very high debt to GDP (160% of GDP at the end of 2014), and the moral hazard risk of the Chinese market make it a high risk to credit. We believe that growth in China’s corporate debt is likely to rise faster than GDP growth in coming years. What’s more, bad debts are rising amid signs that the Beijing authorities will allow some companies to default, as the recent default of state-related entity Baoding Tianwei Group shows. Why is corporate debt still growing in China? It is common knowledge that the Chinese economy has expanded enormously over the past five years, although its growth rate has recently stepped down. However, what is less appreciated is that corporate debt escalated this growth. In fact, Chinese corporate debt has surpassed that of the US for this surge is structural. China's central government had implicitly decided that "capitalism with Chinese characteristics" required that debt be incurred by companies, including state-owned enterprises (SOE). This has ballooned corporate debt in China to eight times the size of the government's. Our analysis of a sample of listed Chinese companies indicates that their financial risks have worsened by the equivalent of about a notch since 2009. 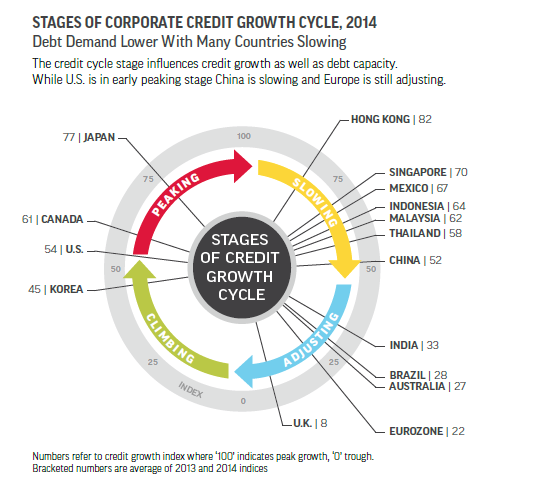 As China's corporate credit growth cycle slows, we expect defaults to pick up. Consequently, we view China's corporate debt as tail risk number one. Can the Chinese government manage rising risks? We do recognize that the government is trying to address risks. Besides recently lowering interest rates to shore up economic growth, Beijing has begun a plan to swap at least Rmb1 trillion ($160 billion) of local government financing vehicle debt (a type of SOE) for municipal bonds (effectively moving the debt onto the government’s balance sheet). Future policy action would be critical in moderating or amplifying the impact from the cycle's slowdown. The more Beijing prudently manages such risks, the less of a threat such risks are. Do you have concerns about corporate debt elsewhere in Asia? We expect the megatrend of emerging markets’ debt overtaking that of developed markets to continue based on sheer momentum. These markets’ higher credit intensity, stronger nominal GDP growth, and large outstandings (primarily China’s) will propel the trend. We have lesser, albeit mixed, concerns about corporate credit in Asia (ex China), with some countries relying more on Chinese goods and services demand than others. We expect fast corporate debt growth to continue for Hong Kong and Singapore due to their very high credit intensities. We also project rapid growth for Indonesian corporates as its economy further develops. Further, India’s corporate debt growth will outpace others because its forecast high nominal GDP growth should boost demand. Naturally, such growth has its own risks. We are relatively sanguine about Japan's corporate credit given its relatively low growth in credit. Japan’s low nominal GDP growth and still-low credit intensity of 1x mean that debt would expand slowly at the peaking stage. The extended period of secular stagnation (persistently low economic growth) has distorted the normal credit cycle, so its low absolute level curbs the downside in our view. Will a slowing economic environment exacerbate the debt risks? We regard global economic risk to credit as low to moderate. In China, companies are still adapting to lower economic growth, keeping risks moderately high. Other emerging markets too have moderately high risk, with some facing slowdowns partly because of commodity price declines. While disinflation risk is moderately high for producers, it is low for consumers, so overall it is moderate. The risk of property overvaluation is moderately high for some. Residential prices in Hong Kong, India, Indonesia, Malaysia, and Philippines have risen faster than GDP growth. Given the importance of real estate as loan collateral and its economic contribution, any reversals here have repercussions for general credit risk. Are there any funding capacity or refinancing concerns? As the credit cycle turns, weaker debtors in emerging markets and US leveraged finance may struggle to raise new debt or refinance. The emerging markets of Asia are a mixed bag. Some regulators, as in China, have lowered interest rates and still have room to reduce them, but they fear stoking credit inflation. We see the funding risk in China as low and in other emerging markets as moderate. Japan's funding capacity is also of low concern given the liquidity trap (cash injections are ineffective to spur economy amid low interest rates) it has endured. We expect the megatrend of emerging markets’ debt overtaking that of developed markets to continue based on sheer momentum. These markets’ higher credit intensity, stronger nominal GDP growth, and large outstandings (primarily China’s) will propel the trend. While the credit cycles in the emerging markets (and Asian money centers of Hong Kong and Singapore) are slowing, we expect their credit intensities to remain above those of advanced markets given their stages of economic development. The author of this article is Terry Chan, a managing director in Standard & Poor’s Ratings Services’ Corporate Ratings team.